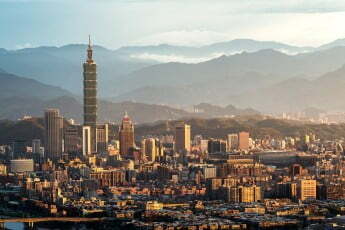 Discover the monuments, markets and amazing flavours of Taipei, then explore more of Taiwan on an enchanting circuit of national parks, seaside cities, villages and hot springs. Your non-stop flight from Auckland is scheduled to arrive at Taoyun Airport in the late afternoon. You can catch the new high-speed train to Taiwan Main Station (35 minutes), then the MRT train or taxi from there to your accommodation. We recommend you stay somewhere around Ximen Station, so that you'll have easy access to the vibrant street shopping, food and nightlife of Ximending; several popular Taipei attractions and the amazing MRT transport system. Freshen up and change into comfortable walking shoes, it's time to stretch your legs a little to help reset your body clock to local time. Ask your accommodation to recommend a street food stall or restaurant - they're everywhere. You could even keep it light and snack at several as you walk. Dip your toes into the Ximending night market streets to get a feel for the hip Taipei vibe and to get your bearings for a proper visit another night. Most shops are open from 10am until midnight and night markets run from around 5pm until 1am, so mornings are perfect for exploring Taipei’s landmarks and fascinating attractions before hitting the shops and markets. If you like to start the day with great coffee, head to Fong Da Coffee House. Operating since 1956, they offer a huge menu of espresso coffees and teas, as well as toasted sandwiches and all kinds of decadent cakes. Walk east on Chengdu Road and around the Jordan store to lane 10 for a photo outside the iconic Red House. Built in 1908, this was Taipei's first public market and is now a cultural centre with regular live performances and exhibitions. At night the square is home to more than 20 small bars and cafés. The National Museum of History next to Taipei Botanical Garden is renowned for Chinese art masterpieces that cover the dynasties. Head east for a cheap feed at Jin Fen Braised Pork Rice. They serve a highly-rated version of Taipei's popular Lu Rou Fan (minced pork on rice) and Kong Ba (melt-in-your-mouth fatty braised pork). There’s usually a queue, but it moves quickly. Finish off with a bubble tea from one of the nearby shops. Catch the metro back to Ximen Station and head to the shops, street stalls and night market atmosphere of Ximending shopping district. Often compared to Tokyo's Harajuku neighbourhood, this neighbourhood lights up with neon, food stalls, street performers and bars. For something completely fun and quirky, grab a bite at the Modern Toilet Restaurant - the name says it all. Hit the streets for a traditional carb and egg-based Taiwanese breakfast, like soup dumplings, egg crepe or warm soy milk, which comes with light crunchy fried dough sticks. Super cheap and totally yum. 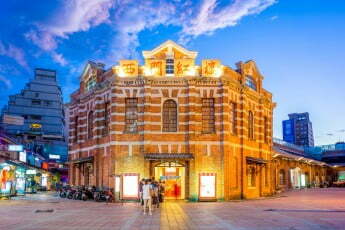 From Beimen Station, walk north along Tacheng Street to historic Dihua Street in Dadaocheng. Take your time to enjoy the architecture, traditional shops, fabric market, temples, food outlets and Chinese herbalists. This is a real taste of old Taipei. Catch bus or metro services to the National Palace Museum. Allow several hours to explore this impressive edifice. It offers a vast collection of outstanding ancient Chinese art across four floors, including paintings, bronzes, jade, ceramics and more. 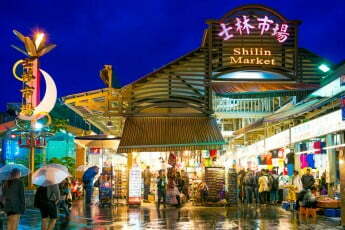 For dinner and evening entertainment, discover the famous Shilin night market. This is the perfect opportunity to sample a variety of Taiwanese street food dishes. There are more than 500 outlets serving classics like Hot Star chicken, soft shell crab, dumplings, prawns, oyster omelettes, spicy pork sausages and the famous stinky tofu. 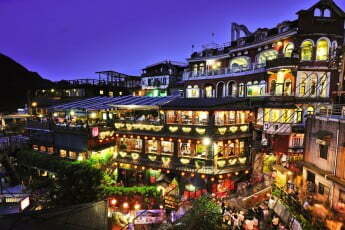 Dating back to the Qing Dynasty, Jiufen was a sleepy little village until gold was discovered in 1893. Then it became a gold rush town. 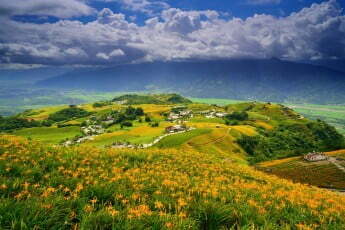 Its position in the hills above the East China Sea is gloriously picturesque. There are various ways to get to Jiufen from Taipei – you can catch the Keelung Bus (route 1062), take the train to Rueifang Station and then catch a local bus, or you can use a shuttle service. Explore enchanting Jiufen Old Street, which is a collection of horizontal and vertical areas connected with steps. This street was the film set for Hayao Miyazaki's Academy Award winning movie 'Spirited Away'. Enjoy the town's retro Chinese and Japanese cafés, tea houses and souvenir shops. Try the local favourite dish - taro balls in a sweet red bean soup. Hike or bus up to Gold Ecological Park to see a slice of 1930s gold mining life. A highlight of this attraction is the Beishan Fifth Tunnel, where you can venture right into the mine. The museum at the park has what’s believed to be the largest gold bar in the world. Catch a cab and head to Houtong Cat Village, where literally of hundreds of cats have made the village a popular tourist spot. This town was originally a coal mining settlement, but today its riches are fur and purrs. 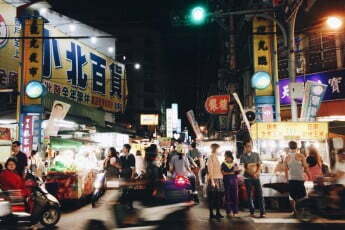 Back in the city, celebrate your last night in Taipei at Linjiang Street night market. Smaller and quieter than Shilin night market, it has a very authentic feel. 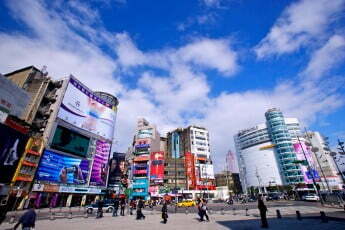 Today you'll leave Taipei to explore more of Taiwan. The train trip from Taipei to Hualien is a relaxing way to enjoy the island's spectacular coastal and mountain scenery. 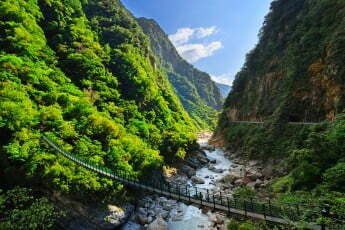 From Hualien, you can catch a tourist bus service to the spectacular marble gorge in the Taroko National Park. Stay tonight in Hualien. Taroko National Park is about 90% mountains; there are nearly 30 peaks over 3000 metres high. But the big drawcard here is Taroko Gorge, a marble-walled rift that’s 18km long. It's one of Asia's greatest scenic wonders. You can see the gorge from various viewing platforms adjacent to the road, but the best way to appreciate its amazing beauty is by going for a hike. A network of trails allows you to see the gorge from many angles. One of the most exciting hikes is the Baiyang Trail, which involves a 380m tunnel and the spectacular Water Curtain Cave. The trail begins near the village of Tianxiang. A special surprise in Taroko National Park is the Tianfeng Pagoda in Tienhsiang - seven tiers of magnificence that makes an amazing photograph against the backdrop of forested mountains. Back in Hualien, find a local restaurant for dinner. If you love seafood, try an oyster omelette. The best local dessert is tapioca pearls served with shaved ice drizzled with caramel. Collect your rental car in Hualien and drive south to Sixty Stone Mountain, the heart of Taiwan's daylily growing industry. The scenery is exceptional at any time of the year, but particularly amazing during the lily flowering season (August and September). Tonight you'll stay in Taitung, a coastal city with a laid-back vibe. Pick up some sandwiches, sushi or dumplings in Hualien for lunch on Sixty Stone Mountain. At the mountain’s summit there’s a path leading to the Wanyou Pavilion – the Forgetting Sorrow Pavilion. Perfect spot for a picnic! 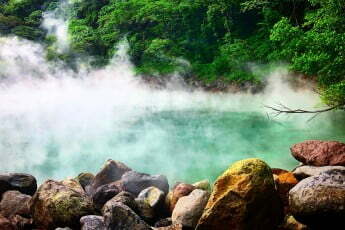 Nearby is Antong Hot Springs, for more wonderful scenery and a relaxing hot soak. There are numerous pools and spas in this village. In the city of Taitung there’s a local bohemian culture that has given rise to some great cafes and shops. Check out the Gallery of Taitung Aboriginal Exhibition Centre, which has a wave-shaped roof. Nearby Fugang Port is an interesting place for authentic sightseeing, complete with local fishing boats. You can catch a ferry to Green Island, just off the coast of Taitung. There are saltwater hot springs, hiking trails and snorkelling spots here. The street food at Taitung night market gets great reviews. Try the giant takoyaki - a fist-sized snack filled with diced octopus, broccoli, shrimp, mushroom and fish balls. Gua bao is also recommended - a fluffy steamed bun filled with grilled pork, pickled vegetables and peanut powder. Continue your road trip until you get to the southern tip of Taiwan - Kenting National Park, one of the locations used for Ang Lee's movie 'The Life of Pi'. Here you can throw yourself into Taiwanese beach culture with surfing, snorkelling and diving. There are plenty of accommodation options along the western coast of the Kenting Peninsula. More than 60% of the world’s coral species can be found in the waters off Kenting National Park, plus more than 1000 species of reef fish. Frog Rock and Sail Rock are two great spots for a snorkel. Roam around Sheding Nature Park to see sika deer, native birds and monkeys. Another nature trip is the Kenting Forest Recreation Area, a forest that was once an undersea coral reef. There are caves, canyons and ancient banyan trees. Snap a selfie with the Eluanbi Lighthouse, which is in a park laced with hiking trails that wander in and out of huge chunks of old coral. April's time for the Spring Scream in Kenting. It's Taiwan's longest-running outdoor music festival. Jialeshuei Beach in Kenting is one of Taiwan's best surfing locations. You can hire a board here and even take lessons. It takes just over two hours to drive to Tainan, the heart of traditional Taiwan. This city was the island's capital for more than 200 years, so there's some great historic architecture to enjoy. You'll find fewer tourists here, so it’s easier to make your way around the places of interest. Visit Anping Fort (Fort Zeelandia), which has a Dutch tower that dates back to 1653. There's also a treehouse near the fort that you have to see – it's a banyan tree that has grown around an old warehouse. There are many fabulous temples in Tainan – the Confucian Temple, Fahua Buddhist Temple, Tainan Grand Mazu Temple and Sanshan Guowang Temple, just to mention a few. Go shopping at the Hayashi Art Deco department store (aka Lin's Department Store). This 1930s retail paradise was fully restored recently and the locals are hugely proud of it. See if you can catch a baseball game at the city's stadium. The crowd's loud and the baseball action is fiercely competitive. Tainan Garden Night Market is the place to eat if it's Thursday, Saturday or Sunday. Otherwise, find a BBQ restaurant – Tainan does a great 'hot pot and grill'. Set in a forested valley at the foot of Xueba National Park, Onsen Papawaqa is one of the most luxurious hot springs resorts in Taiwan. For your last night in Taiwan, it's exactly what you need. Get relaxed hopping in and out of hot and cold pools, then enjoy the resort's highly acclaimed restaurant. If you'd rather stay somewhere more affordable, you can visit Onsen Papawaqa's hot springs and then stay in nearby Sanyi. From April to September there are fireflies in this area. You might also see eagles. It will take just over two hours to drive from Tai'an to Taipei International Airport for your flight home to Auckland.